If you want to win someone’s heart on Valentine’s Day, a good start is to go with a combination of caramel, sea salt and chocolate. 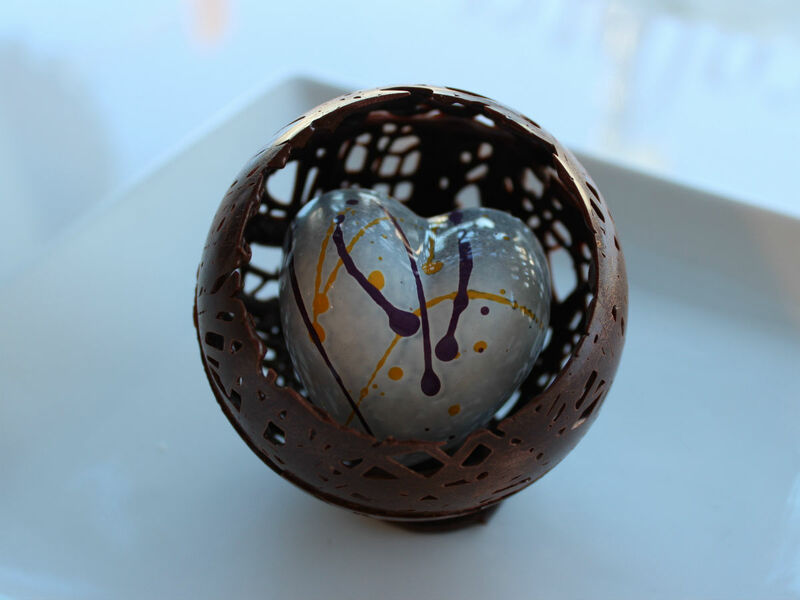 An even better start is to get that combination set inside a glossy, nearly too precious to eat heart shape, which is then suspended in a chocolate sphere that shimmers with luster dust. If you want to step up your game even more, get this chocolate and drop some knowledge on where that specific fair trade organic chocolate came from – because nothing is sexier than getting the story behind the sweet stuff. Before we get into the sweet stuff – of which there is a lot, as Popp Chocolates produces nearly 500 types of chocolate creations per year – you must start with the bean. “A lot of people get cacao beans from all over the place, but like coffee beans they are getting a mishmash of grades of quality,” said Menzies. Since 2014, over 10 per cent of the creations at Chocolatier Constance Popp have been the result of processing raw cacao beans into chocolate, making them the first bean to bar maker in Winnipeg. There are three main types of cacao beans. Criollo beans are the rarest and most complex in flavour, so unsurprisingly they are also the most expensive. The most common bean is the Forastero, a hardy variety suitable for mass production that is generally cited as representing 80 per cent of the world’s cacao beans. It’s taste is more bitter, with less complexity. Then there is Trinitario, which is a hybrid of these two beans. They tend to be heartier, less intensive to grow and ship, and they can vary greatly in taste and quality. “We seek out beans that come from all over the world,” said Menzies. “Most beans are harvested and grown in Africa – about 80 per cent is the figure most experts give. But for us, it is interesting if they also come from Fiji, if they come from Haiti, Guatemala, Peru, or Cuba -- because they definitely all taste different." First, the beans grow in pods the shape of small footballs on the trunks of cacoa trees. They are low to the ground, so it is advantageous to be short if you are a picker. (This is why children, sadly, are often employed as cacao pod pickers -- which is another reason why Constance ensures her beans are always fair trade certified). Pods will yield about 60 beans that are initially pulpy and pliable. After they are picked, the beans are laid out and fermented under large leaves or in vats for a few days, before being air dried, which is what transforms them into the cacao bean that you would recognize. When Constance brings the beans in, they are still in a thin skin that you can peel off with your hands. A winnowing machine blows off the skin, and from there they are toasted in the shop by Ray “The Roaster” Tara. Once roasted, the cacao becomes cocoa – which is one of those know-it-all food nuggets that you should bust out at your next dinner party. In many ways, the process is a bit like coffee roasting; you could still have great Criollo beans and turn them bitter by over-roasting. As an experiment we did taste tests on Haitian beans, trying first the raw cacao followed by the toasted cocoa. The raw form was dry and brittle, with a mainly nutty note and a slight bitter finish. They were quite tasty, but not something you would associate with chocolate. Once roasted (for about 18-19 minutes at a low heat), it is quite astonishing how creamy, complex and fruity the flavour becomes, while instantly making it recognizable as chocolate. This in-house roasting also a contributes to the tantalizing smells inside the shop. From there, the roasted beans are run through a juicer, which turns them into a pulp, before going into a melanger which grinds the pulp to a chocolate syrup of sorts. From there, it can be tempered, transformed, flavoured and set into the hundreds of stunning creations in the shop. Right now for Valentine’s, the Chocolatier Constance Popp is particularly well-stocked (it’s the only time of the year that you’ll see the staff pre-compose boxes of chocolates). You can get traditional looking boxes like the crimson “Relationship Series,” which gets you 12 decadent chocolates for $52 (a real V-Day gift that keeps on giving); the hearts within a heart box, which is a larger, hollow heart-shaped chocolate filled with small chocolate hearts; or a large chocolate stiletto (100 per cent edible) that would surely win any shoeaholic’s heart. My top choice are the Valentine Chocolate Hearts (alluded to in the lede), which are the kind of indulgence that you must close your eyes while eating. The red ones are filled with an oozing caramel sea salt perched on top of barely set marshmallow. The white ones are filled with a passion fruit jel and more of that creamy marshmallow. I gave my wife one of each the other day. After thanking me she quickly demanded that I stop talking while she ate them -- a moment of silence was needed to fully comprehend how good they were. You really shouldn’t need any more convincing than that. Chocolatier Constance Popp is located at 180 Provencher Boulevard and is open Monday to Friday, 10 a.m. – 6 p.m. and Saturdays from 10 a.m. – 5 p.m. Closed on Sundays until May long weekend.